In the 1920s, Adriaan Jan Dekker helped redesign windmill sails in the Netherlands to improve their efficiency. His modified sails were streamlined and acted more as airfoils than the traditional sails in use. Dekker’s first sail was tested briefly in 1927, with more expansive tests in 1928. By 1930, 31 windmills were using Dekker’s sails, and the number increased to 75 by 1935. Drawings from Adriaan Dekker’s rotary propellers patent (US 2,186,064). The direction of rotation was actually opposite of the unit that was built and installed on a Fokker C.I. Note the airfoil sections of the blades. 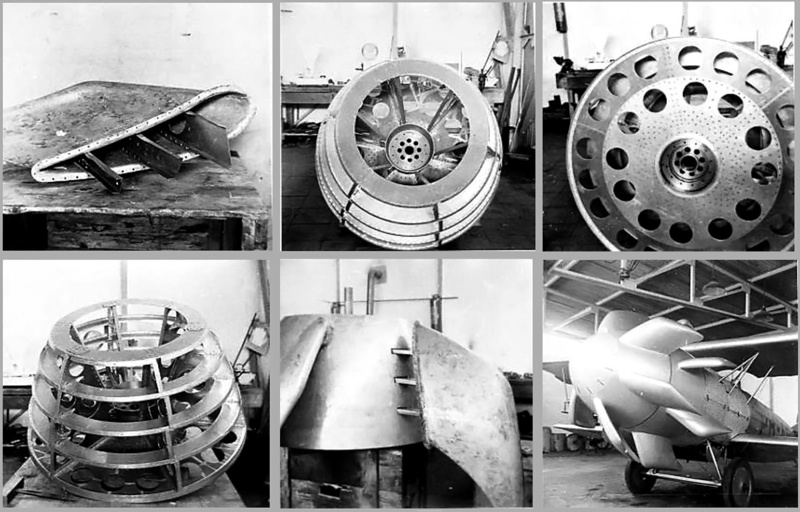 In the 1930s, Dekker began to focus on improving aircraft propellers. 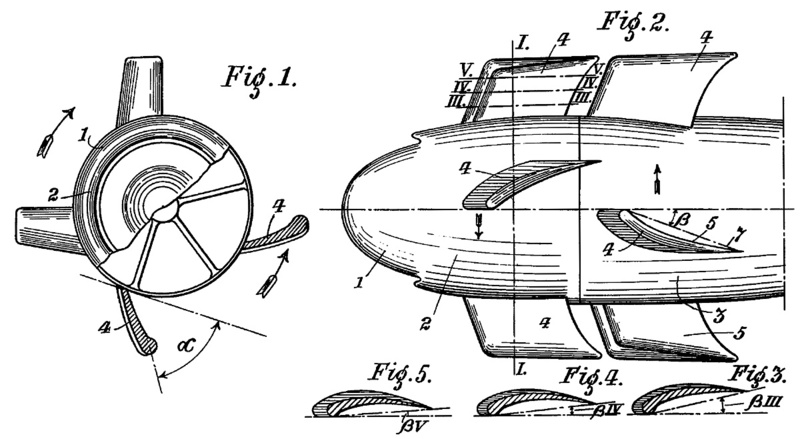 In 1934, Dekker filed for a patent on a new type of turbine rotor blade for aircraft use. British patent 450,990 was awarded on 27 July 1936, and it outlined the use of a single rotation, four-blade rotary propeller. However, Dekker found that a single set of rotors caused a divergent airflow that virtually bypassed an aircraft’s tail. This caused control issues because it decreased airflow over the aircraft’s rudder and elevator. Dekker continued to develop his design and applied for another patent in June 1936, before the first patent was awarded. The new British patent (476,226) was awarded on 3 December 1937 and outlined the use of contra-rotating rotors. Strangely, the gearing for the propellers was not included in the British patent but was included in the US (and French) patent filed on 19 May 1937 and granted patent 2,186,064 on 9 January 1940. Almost all of the information contained in the British patent was also in the US patent. However, the US patent was more detailed and included additional information. The patents illustrate a large, streamlined hub from which two sets of four-blade rotors protrude. The original patent stated that the ideal blade length was one third of the hub diameter. The fixed-pitch blades were highly curved airfoils of a complex shape. The angle of the blade decreased from 40 degrees at the root to 5 degrees at the tip. In addition, the blade’s cord (length from leading edge to trailing edge) steadily increased from its root to its tip. The two sets of blades were contra-rotating. The rear set of blades served to straighten the airflow from the front set, providing additional thrust and increasing efficiency. The contra-rotation of the blades also helped eliminate torque reactions. Through a gear reduction, the rear set of blades only turned at two-thirds the speed of the front set of blades. Dekker also noted that the rotary blades would be quieter than conventional propellers. Dekker’s finished C.I with its large rotary propellers. Note the complex airfoil shape of the blades. The drive for the rotors consisted of a sun gear mounted on the engine’s crankshaft that turned planetary gears against a fixed, internally-toothed ring gear. The planetary gears were mounted in a carrier from which a shaft extended to power the front set of blades. These blades rotated in the same direction as the engine and at an unspecified reduction. Attached to the shaft powering the front set of blades was another sun gear. This sun gear turned three idler gears that turned three planetary gears against another fixed, internally-toothed ring gear. This gear train reduced the rotation speed by 66% from the sun gear (and front set of blades). A hollow shaft extended from the planetary gear carrier to power the rear set of blades. Inside the hollow shaft was the propeller shaft for the front set of blades. The rear set of blades rotated the opposite direction of the engine. To turn theory to reality, Dekker formed a company, Syndicaat Dekker Octrooien (Dekker Patents Syndicate), and acquired a Fokker C.I trainer aircraft around 28 March 1936. 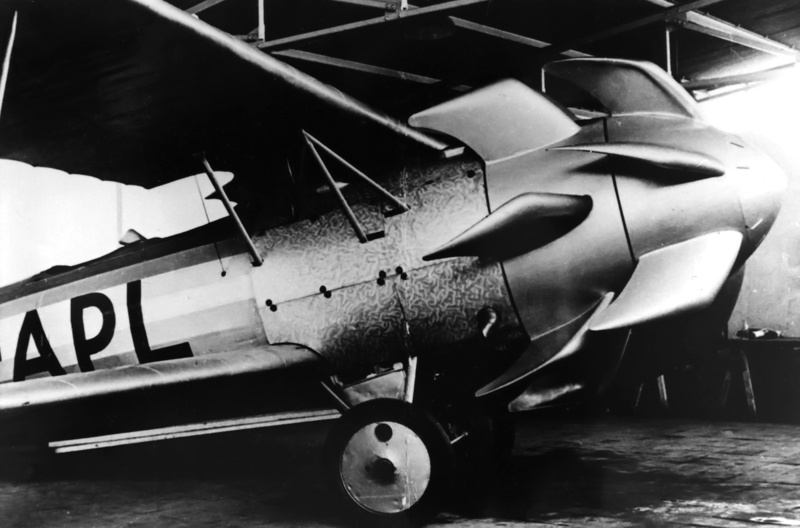 The C.I was a late World War I era biplane reconnaissance aircraft powered by a 185 hp BMW IIIa engine. As the aircraft’s design aged, transport and trainer versions were built. Dekker’s C.I was registered PH-APL on 15 April 1937. 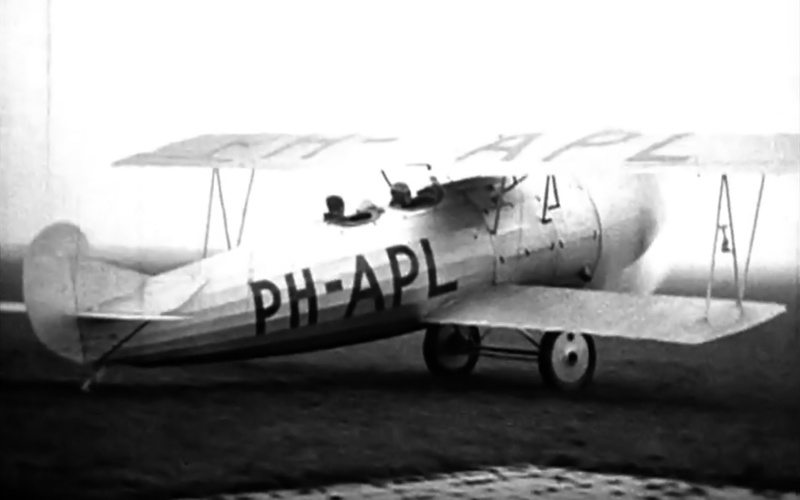 Registered PH-APL, Dekker’s heavily modified Fokker C.I bears little resemblance to a standard C.I; the wings and tail are about all the aircraft have in common. Note how the fuselage shape tapers the diameter of the large propeller hub back to the tail. With its contra-rotating rotary propellers spinning, the aircraft is shown before taxi tests at Ypenburg airfield. To accommodate the rotary propellers, Dekker’s aircraft was so heavily modified that it was nearly unrecognizable as a C.I. 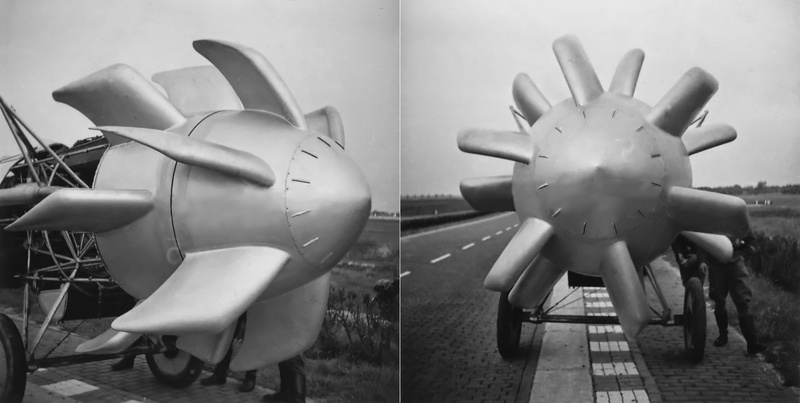 The aircraft retained the BMW engine but had the contra-rotating rotary propellers mounted to its front. The fuselage of the aircraft was modified and tapered from the very large propeller hub back to the tail. The fuselage was metal-covered immediately behind the propellers, but the rest of the fuselage was covered with fabric. The rotary propellers differed from those illustrated in the patents in that six blades made up the front set of rotors, and seven blades made up the rear set. Construction of the individual blades was similar to that of a wing. The blades were made of a shaped aluminum sleeve fitted around three spars. The spars passed into and were connected to the hub. The roots of the blades were also attached to the hub. The hub was formed of an aluminum frame and covered with aluminum sheeting. Video indicates that the rear set of blades had roughly a 66% speed reduction compared to the front set—which matches what was stated in the patent. Two views of Dekker’s C.I after it was captured by German forces. The right image clearly shows six blades on the front rotor and seven blades on the rear rotor. The aircraft’s completion date is unknown, but Dekker’s C.I underwent taxi tests at Ypenburg airfield, near The Hauge, Netherlands. The aircraft reportedly made a few hops into the air, but no true flight was achieved. It is not clear if there was an issue with the rotary propellers (such as insufficient thrust or excessive vibrations) or if the project simply ran out of time. Dekker’s C.I was moved to Waalhaven Airport, where it was captured by German forces on 18 May 1940, eight days after the Germans started their invasion of the Netherlands at the start of World War II. Reportedly, the aircraft was taken to Johannisthal airfield near Berlin, Germany for testing. Some sources state the aircraft crashed on its first test flight and that its remains were later destroyed as Russian troops advanced late in the war. However, exactly what happened to Dekker’s C.I and its rotary propellers is not known. Below is video uploaded to YouTube of the Fokker Dekker C.I undergoing taxi tests. Note the stroboscopic effect of the rotors turning at different speeds. Adriaan Dekker is shown at the end of the video. It is interesting to contemplate how much weight the rotary propellers added to the nose of the aircraft. Unfortunately, the date of the tests is not known. This entry was posted in Aircraft, Between the Wars on 5 April 2017 by William Pearce. Another interesting article about a very little known aspect of aviation history. I would speculate that the propellor had to weigh too much to make it useful. Thank you, Frank. I too would expect the propellers and their gearing to add a fair amount of weight. Thank you, Ronnie. And thanks for sharing. I recognize a lot of your artwork from many books I have. Keep up the great work. Thanks William! And you too – I enjoy your posts!